You know what I love most about summer in Montenegro? No, it's flying across the water with the wind in my hair. There's something about it. I just can't wipe the grin off my face. And I think I'm not the only one, since renting a boat in Montenegro is one of the most popular things to do here! Are you coming to Montenegro and dreaming of hiring a boat to speed around the coast in? You can browse our extensive list of boats for rent here. You have absolute freedom to explore the coast, discover beaches where you can be all alone, drop anchor and explore hidden caves and not worry about any traffic... it's complete bliss! You can hire a skipper to drive you around, but if you want to drive yourself around you'll need a boat licence and Montenegro is the perfect place to get it. The calm waters of the Bay of Kotor are the perfect place to learn to drive a boat and get your licence. And your licence will be recognised around the world, so you'll be able to hire a boat wherever you go. If you want to drive a boat in Montenegro, you must have a relevant licence. That applies to all boats, even if you just want to hire a small one with an outboard motor. Getting a Montenegro boat licence involves sitting an exam with the harbour master in one of the ports. Since the exam is aurel and only done in Montenegrin, it's virtually impossible for you to get a local licence while on holiday. But there is one company here offering internationally-recognised RYA (Royal Yachting Association) powerboat courses. 42 North offers RYA powerboat courses and you can get fully certified in just two days. The RYA is the UK national body for all forms of boating and their qualifications are recognised all over the world - so you can drive anywhere, not just in Montenegro. Over 2,200 RYA training centres in 44 countries around the world. 22,000 RYA instructors around the world. 15,000 professionals on commercial vessels using RYA certification. 155,000 people complete RYA courses annually. Over 100 courses and certifications. 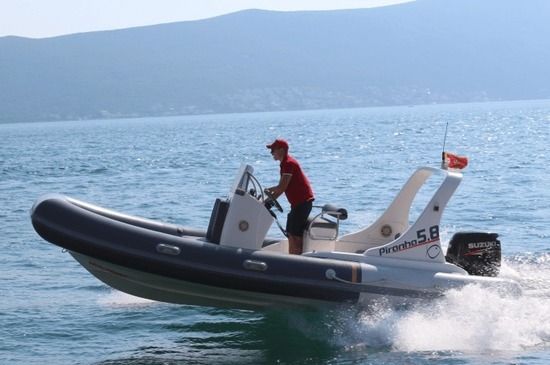 There are two powerboat courses available that will certify you to drive a speedboat in Montenegro. The level 1 course is an introduction that will certifies you to drive under supervision of someone experienced. Kind of like getting your L plates! The level 2 course arms you with thorough theoretical knowledge and practical experience, so you'll feel confident as the skipper of your boat. This is the one you want if you want to hire a boat without a skipper here. The Powerboat Level 1 course is a great introduction to boating and it's even ideal for kids as young as 8. You'll learn all the basic skills and safety measures you need to know at sea. You'll also be able to experience driving a powerboat including coming alongside, leaving a berth and high-speed manoeuvres. 1 day course: 9am - 5pm. Maximum of 3 students per course. This course arms you with the theoretical knowledge and practical experience you need to confidently skipper your own speedboat. After you finish the course, you'll be qualified to skipper a powerboat up to 10m in length during daylight hours. This course can also be commercially endorsed if you complete a basic sea survival course and personal medical. You can do these here in Montenegro too. 2 day course: 9am - 5pm. Maximum 3 students per course. If you'd like to be able to insist everyone call you 'Skipper' - or how about 'Captain'?! - in future, and would like to do your powerboat licence in Montenegro, I can't recommend Ben from 42 North highly enough. Ben's an experienced skipper and all-round outdoorsman who'll have you confidently navigating your way around in a powerboat before you know it. If you'd like to book a course with Ben, or just ask a question about doing an RYA course, you can fill in the form below and he'll get back to you asap.